Host Intro: In part four of Our Northwest Water, Sueann Ramella brings us a report on salmon and its vulnerability to water demands. Ramella: In August, the Northwest saw a rare and unexpected number of Sockeye Salmon return to spawning waters in the mountains of Idaho. It was quite the turnaround from the time of "Lonesome Larry," the lone sockeye that swam more than 900 miles upriver, navigating fish ladders at 8 dams only to find himself the sole salmon in Redfish Lake. Scientists stepped in to help save sockeye from extinction by catching Larry and freezing his sperm for use in hatcheries. But why is the salmon issue so important? Dr. Michael Barber is the director of water research at Washington State University. Barber: "Salmon is very important for a variety of reasons. We have commercial fisheries out in the ocean, local tribal fisheries and sport fisheries in the state that thrive on salmon fishermen. We have the cultural aspects of salmon for many Native Americans in the NW. They are certainly an indication of stream health as well." Ramella: Streams that are also needed for irrigation. And there is also habitat competition from dams. Dams such as the Grand Coulee generate an enormous amount of electricity but also disrupt salmon migration. So why not find alternative energy sources and remove some dams? Barber: "They've been talking about removing Ice Harbor up to the Lower Granite for a number of years, but realistically, from the power it generates, from the barge traffic that moves up and down for the wheat growers, those plans will be talked about, but that would be a very difficult thing to do politically." Ramella: There are programs designed to take into account the needs of farmers, towns as well as salmon. Barber: "Black Rock Reservoir is being proposed over in the Yakima basin where they are looking at taking water from the Columbia during peak flows, pumping it up over the Yakima side of the watershed then releasing that water for irrigation use and the irrigation folks would leave the water in the river for salmon." Ramella: Some salmon even hitch a ride. Barber: "When you go over to the Cowlitz area to see them take the adult fish coming up the stream at the base of the dam and put them in a truck, then drive them up and around and say, 'Here you go guys! Now you're out!' It does get to part of a problem. But it's a never ending cycle." Ramella: Trucking salmon may help the fish pass the dams but a recent study by a University of Idaho fisheries research group suggest that this method may reduce the salmon's ability to navigate upstream. And another issue crops up once the juvenile salmon are ready to migrate back to the ocean: Water pressure. Barber: "The bigger problem is the fish goes from a high pressure system where they are in 100 ft under water on one side of the dam and then come shooting out the other side to 10 ft of water. It's a shock. It’s much like a human diver coming up too fast. Barber: "Getting the bends. You get the nitrogen problems in the fish. It can kill them but more likely then not it stuns them and they become easy prey, at least temporarily." Ramella: Managing the water requirements for salmon is complex. Different species of fish migrate at different times so the timing of what is required is hard to manage. Then there's the issue of funding. We learned in Our Northwest Water that we can have enough water for agriculture, towns and fish, but what we really need is money. For more information on water issues visit Our Northwest at nwpr.org. You can add your comments and find more reports on environmental issues facing the Northwest. I'm Sueann Ramella. Read and listen to the story here. (photo by JB Mellquist) The most endangered salmon run in the Northwest is showing rare and unexpected strength this summer. 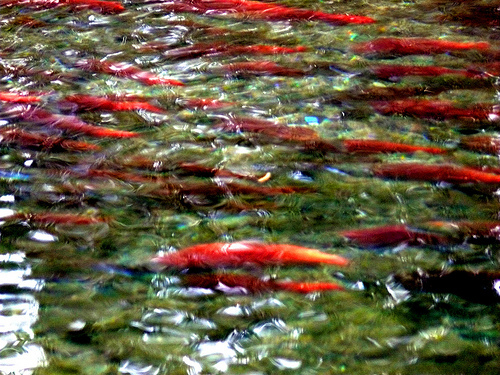 Sockeye salmon by the hundreds are completing an epic journey from the ocean high into the Idaho mountains. Correspondent Tom Banse reports. Redfish Lake takes its name from the sockeye salmon that once colored its spawning grounds. It’s been many decades since the lake in the central Idaho Rockies has lived up to its name. The sockeye run famously dwindled to one fish dubbed “Lonesome Larry” in 1992. 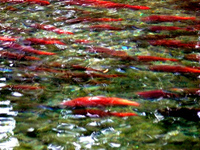 This summer, several hundred fish are expected to complete the longest and highest migration of any Northwest salmon. Idaho Fish and Game biologist Russell Kiefer says the bounce back is gratifying. Kiefer says a combination of factors could explain this year’s remarkable run. The reasons include good ocean conditions, increased hatchery production, and strong, cold river flows during migration. The Sawtooth Valley sockeye run is a small component of the largest surge of “reds” to move up the Columbia River system in half a century. I’m Tom Banse reporting.